It's time to celebrate all Mamas this week and I've got the perfect drink you can serve them that will make them feel special- Bellini! This drink is a twist on the traditional Italian Peach Bellini but used with frozen mixed berries instead. It's bubbly, sweet and refreshing (just like Mom, right?) with a bit of orange zest thrown into it. So, if you're making brunch this weekend, instead of Mimosas, start your mother's morning off right with this feminine new drink instead. In a medium saucepan over medium heat, stir the sugar and water until the sugar dissolves to make the simple syrup (about 5 minutes). Let completely cool. In a blender, puree the mixed berries with 1/3 cup of the cooled simple syrup until smooth. Strain through a fine-meshed strainer. Toss the seeds. If you have any leftover simple syrup, save it! It's great for other cocktails you can make for the evening or during the week. 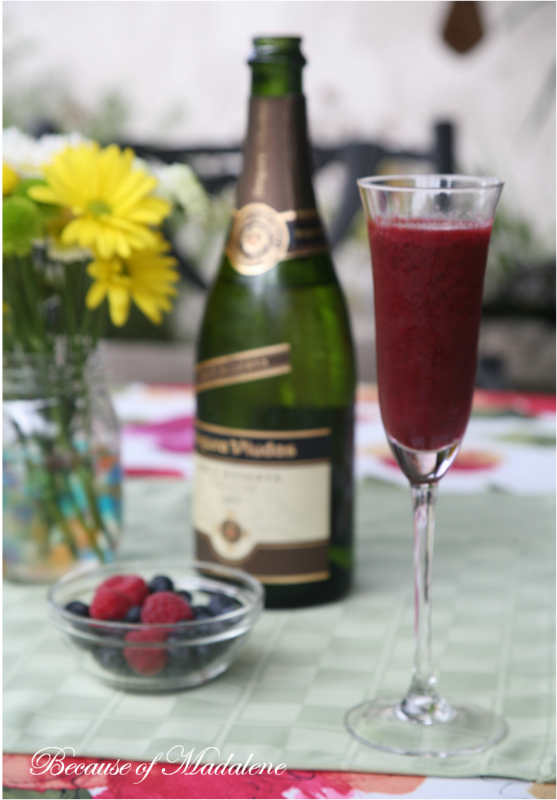 In a champagne glass, pour in about 2 tbsp of the berry puree. Top off the glass with the sparkling wine/champagne. Stir together, garnish and serve!